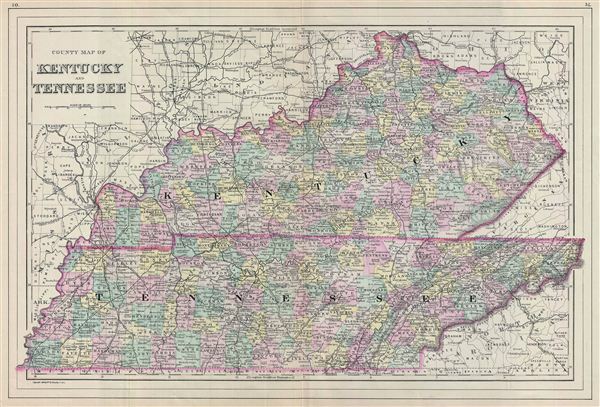 A fine example of William M. Bradley's 1887 map of Kentucky and Tennessee. The map covers both states in fine detail along with parts of neighboring Missouri, Illinois, Ohio, Virginia. Bradley also delineates survey grids west of the Tennessee River, referencing the work of the U.S. Land Survey. Also noted are various cities, towns, rivers, railroads, settlements and an assortment of additional topographical details. Map is color coded according to territorial and political boundaries with elevation rendered by hachure. Copyrighted 1887 by Wm. M. Bradley & Bro., as plate nos. 50 and 51 in the 1890 edition of Mitchell's New General Atlas.